Innovative ergonomics, precision handling, and composite expertise combine in our all-new cockpit system to enhance your every ride. We have spent thousands of hours in the saddle, at the computer and the work bench perfecting our new forks, handlebars, stems and seat posts. These components are designed and built with the same commitment to function, form, and durability that define all PARLEE products. 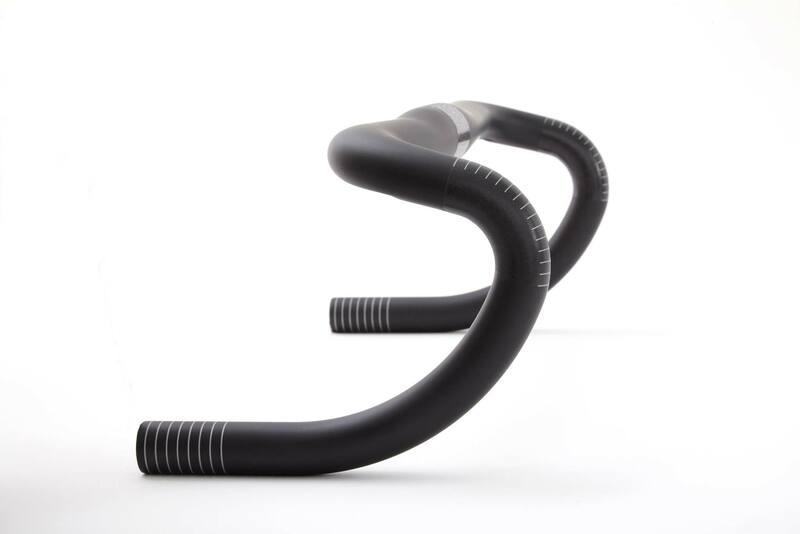 Optimized for how we ride today, our new handlebar is the most comfortable road bar available. The handlebar’s top has a gentle rearward sweep and oval profile for a natural hand position and all-day comfort. The modern 35mm clamping area creates a solid union with the stem and steerer tube. The ergonomic bend has a short 70mm extension and shallow 128mm drop that compliments modern shift/brake lever combinations. This makes the ideal perch for the rider’s hands regardless of build kit. The drops have an extended return creating fuller hand positions for greater comfort. There are also trim lines on the bar termination at 5mm increments for a customized fit. Compatible with all modern rim and disc levers. New for 2019 is compatibility with the new internal Shimano Di2 junction box. The stem is a masterpiece of strength, beauty and performance. Utilizing a 35mm bar clamping diameter, that offers steering precision while the two part face plate is forged for longevity. Titanium bolts are mated to replaceable aluminum inserts throughout protecting your investment from cross threading and other mechanical damage. Our carbon seat post is as comfortable as it is elegant. We custom tuned each of the six sizes available for the perfect amount of comfort where it matters most. This equates to a quiet, comfortable ride that will smooth out the roughest roads. The updated head design uses forged and machined alloy rail clamps, high-strengh washers and stainless screws for lasting performance. Technicians will find it extremely easy to load the saddle and perfectly fine tune the fit. Our posts are compatible with both metal and carbon railed saddles without the use of extra hardware. Our forks use industry leading composite technology, processes and legendary attention to detail to seamlessly blend all-day comfort with race-ready performance. These forks feature the latest technical advances in composite engineering such as advanced bladder molding, carbon fiber composite dropouts and integrated carbon composite crown races. Sizes Available – 43mm offset (rake), 1.250″ to 1.125″ tapered steer tube with integrated crown race. Details – 100% Carbon Fiber construction – 325grams with 400mm steerer, for quick release, Caliper (Rim) brake only. Matte black finish with ghost logos. 369.5mm (Road standard) axle to crown dimension. Maximum tire width is 28mm measured. 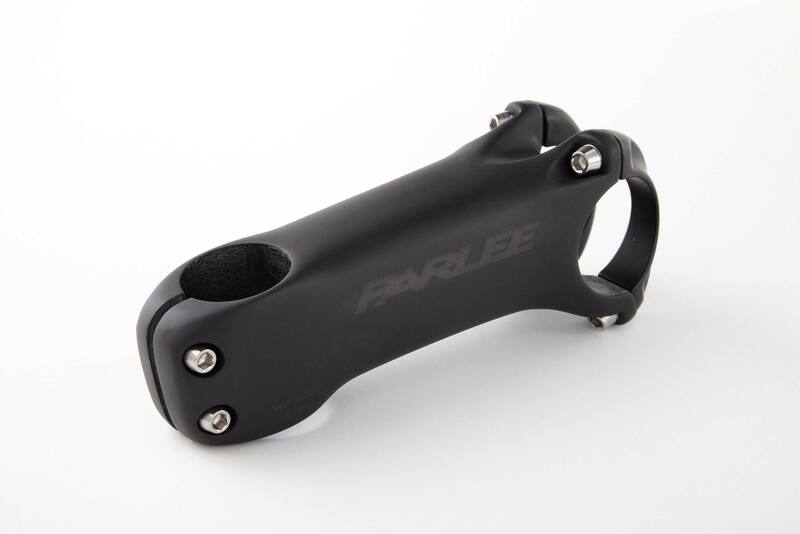 Notes – This fork is compatible with all Parlee road models except Z1/2/3/4. It may also be used on any road bicycle with the 44mm head tube standard by using the Cane Creek 110 Series EC44/33 (lower) and 110 ZS44/28.6 (upper) head set. A compression plug is included. Our flat mount road disc forks use our industry leading composite technology, processes and legendary attention to detail to seamlessly blend all-day comfort with race-ready performance. 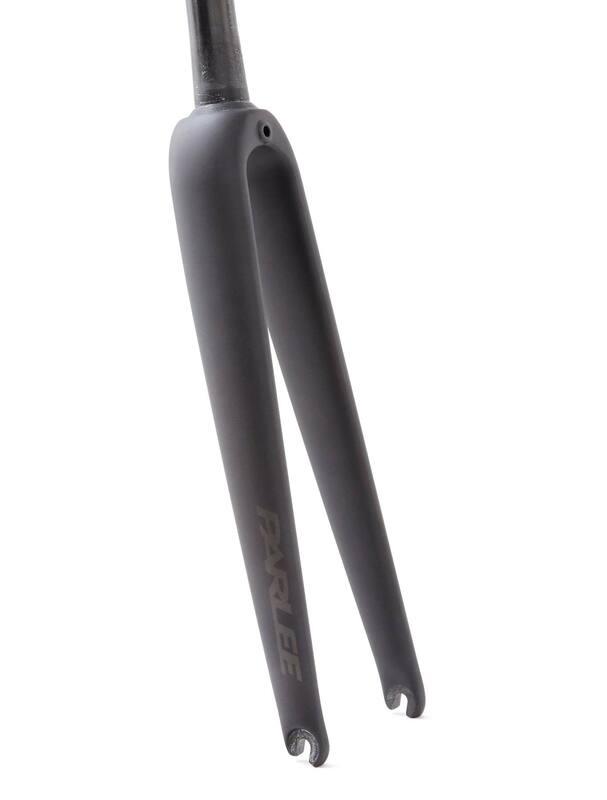 These forks feature the latest technical advances in composite engineering such as advanced bladder molding, carbon fiber composite dropouts, and integrated carbon composite crown races. Sizes Available – 43mm and 52mm offset (rake), 1.250″ to 1.125″ tapered steer tube with integrated crown race for quick release or through axle (12mm x 100mm). Details – 100% Carbon Fiber construction – 400grams with 400mm steerer – Disc brake only. Compatible with 140mm or 160mm (with adapter) rotors and flat mount calipers. Matte black finish with ghost logos. 370.0mm (road standard) axle to crown dimension. Maximum tire width is 28mm measured. Notes – This fork is compatible with our Z-Zero Disc and Altum Disc models. It may also be used on any road disc bicycle using the 44mm head tube standard by using the Cane Creek 110 Series EC44/33 (lower) and 110 ZS44/28.6 (upper) head set. A compression plug is included. The through-axle forks also include a DT Swiss RWS 12mm thru axle. Our new gravel forks use industry leading composite technology, processes and legendary attention to detail to seamlessly blend all-day comfort with epic, all-day race-ready performance. 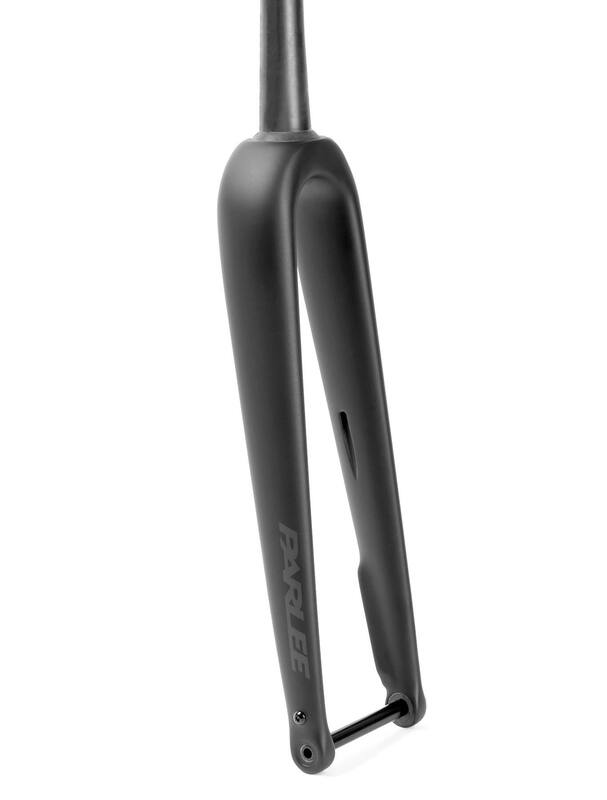 These new forks feature the latest technical advances in composite engineering such as advanced bladder molding, carbon fiber composite dropouts, through axles and integrated carbon composite crown races. Our gravel/cross fork was specifically designed for varying road, dirt, gravel and non-paved surfaces. Integrated fender/mudguard mounts allow for the ultimate in four-season practicality. Sizes Available – 47mm offset (rake), 1.250″ to 1.125″ tapered steer tube with integrated crown race for quick release or through axle (15mm x 100mm) for post mount, (12mm x 100) for flat mount. Details – 100% Carbon Fiber construction – 400grams with 400mm steerer – Disc brake only. Compatible with 140mm or 160mm (with adapter) rotors and both post and flat mount calipers. Matte black finish with ghost logos. 395.0mm (Cross standard) axle to crown dimension. Maximum tire width is 40mm measured. 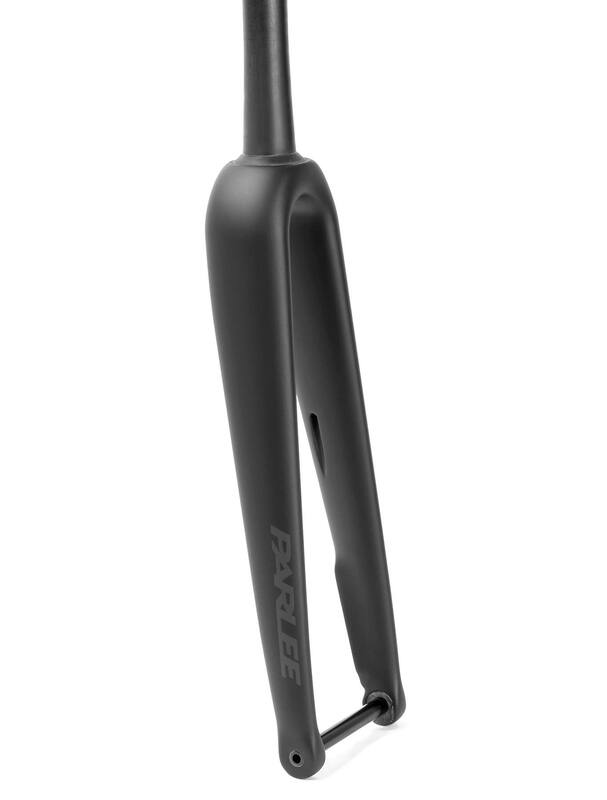 All Gravel/Cross forks include fender mounts on each lower leg and one on the rear of the crown. Notes – This fork is compatible with our Z-Zero XD or Chebacco models. 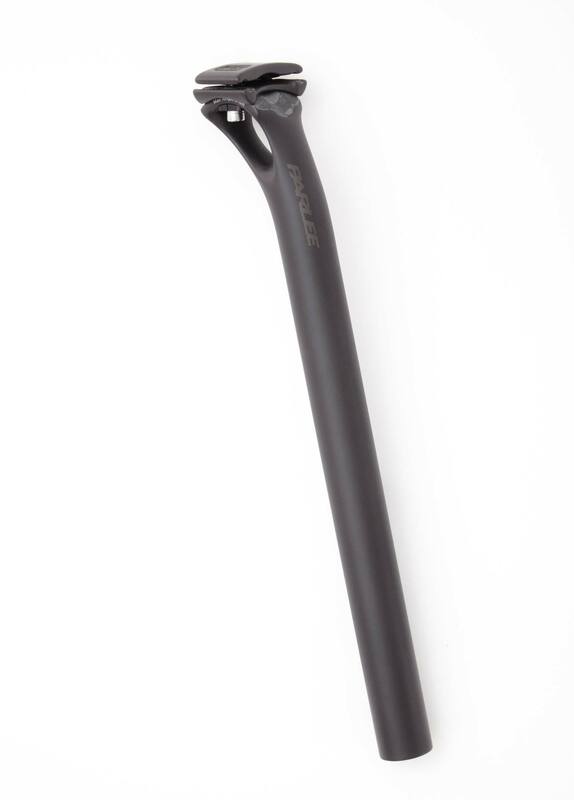 It may also be used on any cross or gravel bicycle with the 44mm head tube standard by using the Cane Creek 110 Series EC44/33 (lower) and 110 ZS44/28.6 (upper) head set. A compression plug is included. The through-axle forks also include a DT Swiss RWS 15mm thru axle (for post mount version) or DT Swiss RWS 12mm thru-axle (for flat mount version).